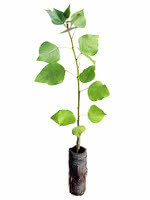 A hybrid of Simon's Poplar and Balsam Poplar, Quebec Poplar is a fast-growing deciduous tree. This particular selection was one of the finalists for the Quebec Ministry of Forest's Hybrid Poplar breeding program. It is useful for quickly establishing a privacy screen or as part of a shelterbelt, and prefers moist soil. Disease resistance is likely high as is cold hardiness. Quebec is a province with a strong forestry sector and we are excited to be offering this variety.